Pro-Motion Distributing - Direct 74369-117-36 - 5. 11 creates products for both professionals and consumers that embody our mission to create purpose-built tactical gear for the most demanding missions. They provide outstanding comfort and performance in harsh conditions, professional and recreational. The stryke pant features front hip pockets sized for a knife or cell phone, double-deep and double reinforced cargo pockets, integrated knee pad pockets kneepads sold separately, and badge holders at the left and right front belt loops. Always Be Ready. The teflon fabric treatment protects against stains, and soil to keep your pants looking their best, BDU military pants, spills, patrol or operator pants, making these mens tactical pants ideal work pants, army combat pants or for casual wear. With comfort features like a self-adjusting tunnel waistband, shooting, kneeling, a fully gusseted crotch and articulated knees you will be prepared for running, crawling, and hustling that your work pants demands. 5.11 Men's Stryke Tactical Military Cargo Work Pant with Flex-Tac, Style 74369, Burnt, 36W x 30L - The 5. 11 stryke pants have many operational features including 12 pockets including double-deep cargo pockets for tactical use, with YKK zippers and Prym snaps making the 511 Stryke pant your go to tactical pant. Stryke pant is made from 5. 11's patented 2-way mechanical stretch 65% polyester/35% cotton ripstop fabric which makes them lightweight and durable. Our newest multipurpose range pant, the Stryke pant is crafted from 5. 11 flex-tac fabric, a specialized proprietary blend of Mechanical stretch polyester and cotton engineered to provide extreme durability and performance in the field. 5.11 Tactical Apparel 73327-P - Flex-tac rip stop fabric. Flex-tac mechanical stretch fabric for lightweight mobility and resilience, and is treated with Teflon to repel stains, soil, spills, and light precipitation. Featuring roomy front a rear pockets, and twin low-profile cargo pockets with internal compartments sized for AR magazines, dual multi-purpose thigh pockets, the Stryke Short offers more than enough space to store your tactical kit. The 12 pockets, keep your hunting, range, including low-profile cargo pockets with AR magazine compartments, or tactical gear in place. They have an 11" inseam and fully gusseted crotch for enhanced freedom of movement, Polyester 65%/Cotton 35%. A full running crotch gusset eliminates constriction and ensures full freedom of movement, while a secure and adaptive waistband keeps your gear stable when you're on the move. 5.11 Tactical Men's Stryke Cargo Military Shorts with Flex-Tac, Style 73327 - Perfect for hiking, patrol, or just as casual shorts. Other features like a dirt, stain and water resistant TEFLON finish and YKK zippers will soon to make these your favorite tactical shorts. The 5. 11 stryke shorts are durable, flexible tactical shorts with enhanced comfort features like the 4. 84 oz. The multi-purpose thigh pockets and low profile cargo pockets keep you and your gear ready. Great Lakes MP 5-71049 - The 5. 11 stryke shorts are durable, flexible tactical shorts with enhanced comfort features like the 4. 84 oz. Always Be Ready. Made with our proprietary SmartWeave fabric, the Performance Polo Shirt resists snags and remains wrinkle free. You can attach your radio microphone to any of the three mic clips on the shoulders and chest placket. The performance Polo Shirt has two pen pockets located on the left sleeve. The synthetic fabric of the Performance Polo Shirts resists stains, tears and snags. The no roll collar has flexible stays which keep the collars from rolling at the edges. The pen pockets are stitched to endure constant use and all seams are designed for both comfort and durability. 5.11 Men's PERFORMANCE Short Sleeve Polo Tactical Shirt, Style 71049 - 5. 11 creates products for both professionals and consumers that embody our mission to create purpose-built tactical gear for the most demanding missions. The 12 pockets, keep your hunting, including low-profile cargo pockets with AR magazine compartments, range, or tactical gear in place. They have an 11" inseam and fully gusseted crotch for enhanced freedom of movement, Polyester 65%/Cotton 35%. Flex-tac rip stop fabric. Moisture wicking, Fully gusseted sleeves, quick drying, Traditional three button placket. Melamine buttons won't burn, Bartacking at major stress points, or melt, crack, Accepts embroidery and silkscreening. 5.11 Tactical Apparel 74273-P - For a proper fit utilize your waist measurement where you wear your pants. 5. 11 tactical has done it again. Perfect for hiking, patrol, or just as casual shorts. Other features like a dirt, stain and water resistant TEFLON finish and YKK zippers will soon to make these your favorite tactical shorts. An external knife pocket on the right front side gives you easy access to a 5. 11 knife. Made of lightweight 65% polyester and 35% non-fading polycotton ripstop, you have a pant that is extremely functional and maintains a neat, clean and professional look. The 5. 11 stryke shorts are durable, flexible tactical shorts with enhanced comfort features like the 4. 84 oz. Gussetted construction for flexibility and strength. 5.11 Men's Taclite Pro Tactical Pants with Cargo Pockets, Style 74273 - 5. 11 creates products for both professionals and consumers that embody our mission to create purpose-built tactical gear for the most demanding missions. The 5. 11 taclite pro pant comes in black, tundra, TDU Green, Coyote, TDU Khaki and Dark Navy. Our new taclite pro pant is ready for wear and we know this one will be a hit. 5.11 Tactical Apparel 74434-P - Ideal for tactical, or covert wear, casual, the Apex pant is built from 7.2 oz. Signature rear strap and slash pocket design; rear web strap. A flexible comfort waistband, spills, seven sturdy belt loops, and articulated knees ensure complete freedom of movement, a fully gusseted crotch, and a Teflon treated exterior repels stains, and soil to keep you looking your best. Moisture wicking, Fully gusseted sleeves, quick drying, Traditional three button placket. Melamine buttons won't burn, Bartacking at major stress points, crack, or melt, Accepts embroidery and silkscreening. Why 5. 11 - apparel that is built for your environment. 5. 11 creates products for both professionals and consumers that embody our mission to create purpose-built tactical gear for the most demanding missions. 5.11 Men's Apex EDC Pants - Lightweight 65% polyester and 35% poly cotton ripstop is treated with HT Teflon wear-resistant finish. Internal cargo pouch magazine pockets flex-cuff pocket inside front waist, handcuff key pocket inside rear waist, TWIN back yoke magazine pockets. Gussetted construction for flexibility and strength. Always Be Ready. Flex-tac mechanical stretch canvas that offers extreme durability while remaining flexible and mobile. 5.11 Footwear (ACK, LLC) 74411_070_40_32 - Exceptionally durable with triple-stitch reinforcement and extensive bartacking at major seams and stress points. Premium fabric blend - made from 6. 76 oz, 62% polyester and 38% cotton ripstop fabric, these pants provide a durable, flexible covert bottom with optimum comfort. Comfortable fit - featuring a fitted waistband, and double-stitching, fully gusseted crotch, these men's pants will surely look great and move with you throughout the day. Uniform pants - developed with teflon finish, and moisture-resistant for a quality that's long-lasting. Perfect for hiking, patrol, or just as casual shorts. Other features like a dirt, stain and water resistant TEFLON finish and YKK zippers will soon to make these your favorite tactical shorts. Ykk zippers. 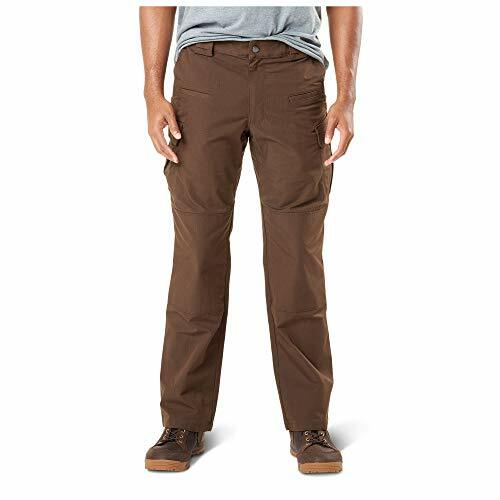 5.11 Tactical Men’s Ridgeline Covert Work Pants, Teflon Finish, Poly-Cotton Ripstop Fabric, Style 74411 - Prym snaps, clip loop. Hip-mounted d-ring. Gussetted construction for flexibility and strength. Fully gusseted crotch, comfort waistband, articulated knees provide comfort, range of movement and durability. Sorona 42%/cotton 31%/Polyester 27%. The new ridgeline Pant from 5. 11 tactical combines a casual look and feel with tough and ruggedized high performance utility. Fairwin - Warranty: 2-year no questions asked warranty and 30-day money back guarantee. Internal cargo pouch magazine pockets flex-cuff pocket inside front waist, handcuff key pocket inside rear waist, TWIN back yoke magazine pockets. Lightweight 65% polyester and 35% poly cotton ripstop is treated with HT Teflon wear-resistant finish. Professional appearance, lasting comfort, Snag and wrinkle resistant fabric, no roll collar, 6.7 oz. We aim to provide the best products and service to our customers. Always Be Ready. Gussetted construction for flexibility and strength. Colors available: Black, Brown, Green. Premium fabric blend - made from 6. 76 oz, these pants provide a durable, 62% polyester and 38% cotton ripstop fabric, flexible covert bottom with optimum comfort. Fairwin Tactical Belt, Military Style Webbing Riggers Web Belt Heavy-Duty Quick-Release Metal Buckle - Comfortable fit - featuring a fitted waistband, fully gusseted crotch, and double-stitching, these men's pants will surely look great and move with you throughout the day. Uniform pants - developed with teflon finish, and moisture-resistant for a quality that's long-lasting. Flex-tac mechanical stretch Canvas is Teflon treated to repel stains, soil, and moisture. Moisture wicking, quick drying, Fully gusseted sleeves, Traditional three button placket. Melamine buttons won't burn, crack, or melt, Bartacking at major stress points, Accepts embroidery and silkscreening. 5.11 Footwear (ACK, LLC) 71354-P - Excellent for work or recreational use, at the range, wear it while deployed, or around the campfire. Full inseam gusseted crotch. Jersey knit polyester. Dual pen pockets at left sleeve, Integrated mic loops at the shoulders and chest. 7. 2 oz. Flex-tac rip stop fabric. It's also integrated with ykk zippers, stain-, providing you with pants that are dirt-, adding guaranteed reliability to the apparel. Multifunctional pockets - tailored with 8 high-capacity pockets and 2 hidden rear pockets, this bottom enables you to conveniently store your small tactical gears and other personal items. Professional to casual wear - featuring flex-tac fabric with 2-way mechanical stretch, these pants will surely provide enhanced durability, comfort, and maximized mobility. 5.11 Tactical Men's Stryke Short Sleeve Professional Polo Shirt, Flex Tac Fabric, Style 71354 - Crafted using Flex-Tac mechanical stretch fabric for a versatile shirt. Improved fabric - experience maximum quality that's built for the tough and rugged. Its fabric is teflon treated for stain, and liquid resistance, soil, making it ideal for daily and duty use. Enhanced design - specially made with secure chest pockets, melamine buttons, ready pocket on chest, and bar-tacking at major seams and stress points. Superior performance - built for operational or recreational outdoor activities. The 5. 11 stryke shorts are durable, flexible tactical shorts with enhanced comfort features like the 4. 5.11 59405-019-66 - Lightweight 65% polyester and 35% poly cotton ripstop is treated with HT Teflon wear-resistant finish. Tactical belt length - 45-61 inch, width:1. 5 inch, fit for waist up to 54 inches. Flex-tac rip stop fabric. For a proper fit utilize your waist measurement where you wear your pants. Bartacked stress locations, seven reinforced belt loops, reinforced knife clip area and genuine YKK zippers insure that durability is not an Issue. Its design is made to minimize discomfort while providing exceptional and reliable functionality. Durable, comfortable and functional. The 12 pockets, keep your hunting, range, including low-profile cargo pockets with AR magazine compartments, or tactical gear in place. They have an 11" inseam and fully gusseted crotch for enhanced freedom of movement, Polyester 65%/Cotton 35%. 5.11 Tactical Operator 1 3/4" Belt, Military Style, Heavy-Duty Nylon Mesh 5100lb Tensile Strength, Stainless Steel Buckle, Fade & Rip Resistant, style 59405 - . The multi-purpose thigh pockets and low profile cargo pockets keep you and your gear ready. Always Be Ready. If just one tab is engaged, the connection will hold and fully re-lock on its own. Quality nylon belt - made by 1000 D environmental friendly nylon material, soft and comfortable for daily use. Perfect service - 2 year quality warranty. - Two cargo pockets; magazine/cell phone pocket. Moisture wicking, quick drying, Fully gusseted sleeves, Traditional three button placket. Melamine buttons won't burn, crack, Bartacking at major stress points, or melt, Accepts embroidery and silkscreening. Why 5. 11 - apparel that is built for your environment. Reinforced stitching. Large cargo pockets feature LA Police Gear's top pass through for quick access and are slanted for seated access. The 12 pockets, including low-profile cargo pockets with AR magazine compartments, range, keep your hunting, or tactical gear in place. They have an 11" inseam and fully gusseted crotch for enhanced freedom of movement, Polyester 65%/Cotton 35%. LA Police Gear Mens Urban Ops Tactical Cargo Pants - Elastic WB - YKK Zipper - Super strong 1. 75 inch nylon mesh material. The multi-purpose thigh pockets and low profile cargo pockets keep you and your gear ready. External knife pocket. Exceptionally durable with triple-stitch reinforcement and extensive bartacking at major seams and stress points. Tactical belt length - 45-61 inch, width:1. 5 inch, fit for waist up to 54 inches. Flex-tac mechanical stretch Canvas is Teflon treated to repel stains, soil, and moisture. 5.11 5-73287 - Cardura knife reinforcements at front pockets. Premium fabric blend - made from 6. 76 oz, 62% polyester and 38% cotton ripstop fabric, these pants provide a durable, flexible covert bottom with optimum comfort. Comfortable fit - featuring a fitted waistband, fully gusseted crotch, and double-stitching, these men's pants will surely look great and move with you throughout the day. Uniform pants - developed with teflon finish, and moisture-resistant for a quality that's long-lasting. Purpose built when law enforcement officers, range professionals, or field operators need reliable men's lightweight tactical shorts, the 5.11 taclite pro Short is the consistent choice. Features a high end ykk Locking Brass Zipper and a tough brass tac-stud closure for the waist. 5.11 Tactical Men's Taclite Pro Cargo Pocket Active Breathable Casual Shorts, Style 73287 - Large cargo pockets feature LA Police Gear's top pass through for quick access and are slanted for seated access. The front slip pocket is perfect for a cell phone or for an AR-15 magazine. Crafted using Flex-Tac mechanical stretch fabric for a versatile shirt. Improved fabric - experience maximum quality that's built for the tough and rugged. Solid stainless Steel Buckle 6000lb rating. Moisture wicking, Fully gusseted sleeves, quick drying, Traditional three button placket. Melamine buttons won't burn, or melt, crack, Bartacking at major stress points, Accepts embroidery and silkscreening.